As the term describes itself that in web design, you do the designing part in order to give it a very attractive look. If you have an outdated website, then update it at the earliest and make it look more attractive. Because a user interactive web page always helps people to stick to it. Everything that you have in your website including the content, the looks and the way it works, comes under web design. Web design incorporates various skills in order to create and maintain different websites. There are different sections of web design which include interface design, user experience (UX) design etc. The main feature of web designing is to attract people towards your website. In order to cover different aspects of your design, you may work in teams if the content is large. For the front-end design process of the website, you need different markup languages. With the help of these markup languages, you can easily write the codes of your site. You can even use different CSS or Cascading Style Sheet in order to provide the best look to the page. The web designers must be aware of the fact that the site should be easy to understand and use. It needs to be updated with the latest web accessibility guidelines for creating the most user-friendly websites. 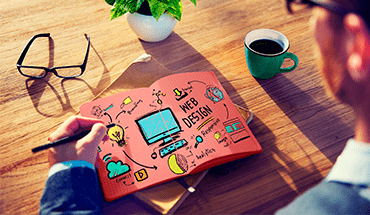 How Does A Well-Designed Website Help To Develop Your Business? If you want your business to run in a tremendous way, then you need to have a website that looks stunning. In exact words, you should have your website designed in such a way that it contains all the information that a customer needs to know in an easy yet appealing manner. A well-designed website helps to develop your business by advertising different products and services. If your website doesn’t look well, then users might face several difficulties to promote your products. A website that is designed in a proper way, offers customers more convenience to surf it. You should design the site in such a way that it brings more leads to your site. In order to increase customers to your site globally, you site must rank in different search engines. Users should not face any problem to access your site. If they face any, then the search engines won’t be able to rank your site. That is why you always need a website that contains attractive and readable content. If you are not aware of the essential facts that you should know in order to have a well-designed website, then have a look at the section below. At first, you should make the website responsive across all devices. The content of your site should be optimistic, unique and consistent. It should take minimum time to load your webpage. The website should contain lists rather than large paragraphs. There should be demographics in your site that make it more engaging. Provide the contact information of your company clearly. The user must not face any difficulties to contact you. Once you have completely gone through the above facts, you will have more convenience to select the web development company that can serve your purpose effectively.